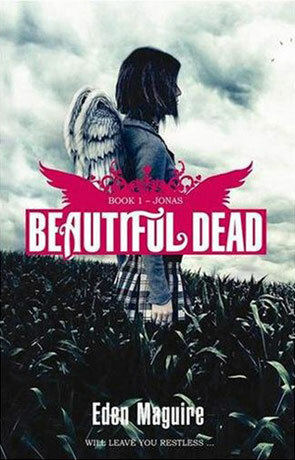 Beautiful Dead: Jonas is the first volume in a new series by Eden Maguire. A young adult novel, Jonas follows the events surrounding the pupils of Ellerton High. Phoenix is the fourth teenager to died within the space of a year, the victim of a knife attack. The three previous deaths, Jonas in a motorcycle accident, Summer by a gunshot wound and Arizona by drowning all died under strange circumstances. As the community tries to come to terms with these losses, stories of ghosts and strange disturbances make these deaths even more difficult to bear. Darina was Phoenix's girlfriend and she finds it impossible to escape the hurt she feels from his untimely demise. The impossible apparitions of those meant to be dead, and the beating wings echoing inside her head don't make matters any easier either. Then one fateful day, Phoenix appears in front of Darina, explaining about the Beautiful Dead, souls who have returned to the world of the living to bring justice to an event that should never have happened. These Beautiful Dead have superhuman powers and are marked by a small angel wings tattoo, known as a death mark. Phoenix explains that the beating wings Darina can hear in her head are the sounds of the millions of Souls in Limbo, desperate return to earth. Darina knows she must help all she can to avenge the deaths of these people, and of course Phoenix. Jonas is clearly aimed at the young adult / teenage market and the writing style is very modern and in a similar vein to the Twilight series but with a detective twist as Darina learns about Jonas Death. The novel itself is very well written but does take a little time to get going, once it does though it is a very rewarding read, dealing with the serious issues of grief and how it effects people in different ways. Ultimately an enjoyable read and reccomended. Written on 8th April 2009 by Ant.